Fantastic article Sig. I actually have been moving to this approach to the market. I’m not one to chase specs, rather take that money and invest in safe more lucrative “stocks”. I don’t fancy myself a day trader. Thanks for reading and sharing your thoughts! I don’t mind taking advantage of small arbitrage opportunities – the typical buy at the old price during a spike and sell at new price approach. But I don’t do that on large scale – it’s a TON of effort and there’s risk that you may be the one left holding the bag. By placing large bets in steady assets, I reduce my risk significantly and look towards slow-and-steady gains to drive portfolio growth. It may not be the most glamorous nor the most profitable, but for me it has a very attractive risk/reward balance. I’m still trying to figure it out myself, it’s quite the phenomenon that goes on, largely unnoticed sometimes. Yeah, obviously those circumstances are still great, (buying pre-spike and selling for example/short selling pre-orders) but investing in steady assets will usually always be a great investment. Might not be the most glamorous, but I’ve been really trying to shift to that. Not the most glamorous, but low effort and low risk if you play your cards right (pun intended). Great article again! You’ve piqued my interest in this topic lately, so I have a few questions about dual lands today. First, are you focusing entirely on revised duals? Revised duals seem like they’ll be easier to move long-term than Unlimited because of the difference in price point. Is this the right way to be thinking about these long term? 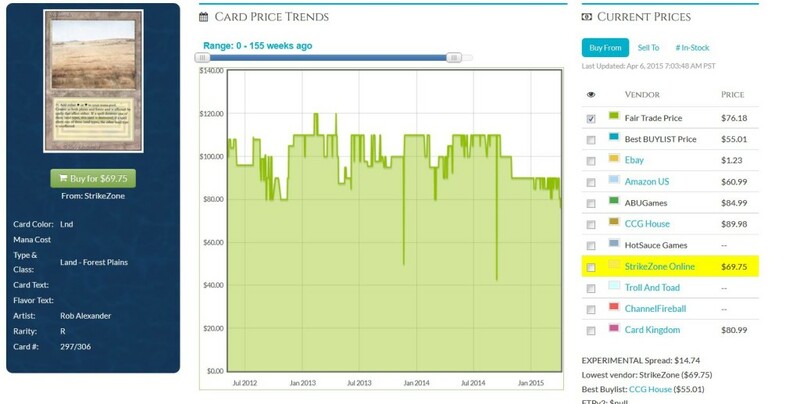 Are you buying them at all different levels of condition or focusing on mint cards only? Thanks for commenting, Michael! I really do appreciate your positive feedback. For now I’ve been focusing on Revised Duals. You’re right in that they are the most liquid and easiest to move, even though they don’t look quite as nice as Unlimited Duals. And they are cheaper, meaning I can buy the same number of them while laying out less cash. These are both attractive to me. NM Duals probably have the best growth prospects, but I find moving SP and MP Duals isn’t too difficult either. Buy listing them may be trickier, but selling to others privately seems to go just find. Many people seeking Duals just want them to play with, and as long as they’re not ripped in half, bent too badly, or signed you’ll find they’re generally in demand. That liquidity is important to me. Thanks for your questions! Hope to see more comments from you in the future! LOL talk about a much debated topic. Fetch lands are more in demand than Shocks, right? But more copies are being opened every day now, so the supply is still ever increasing. It’s a tough call, right? I feel like they’ll always be liquid and you will never regret grabbing one in trade. But I also wonder if their price trajectory is largely flat for at least a year or two. Personally, I have the fetches I need and a few extras – I’m not actively getting rid of them nor am I spending any cash on more at this time. Trading into them seems fine, if only for their liquidity. Sigmund, my thought is that fetches should be better long-term than shock lands, and this is entirely based on usage. Shocks are not played in legacy at all. Fetch lands are staples for both legacy and modern mana bases. In modern, decks will run 8-12 fetch lands and only play a few shocks that they need. 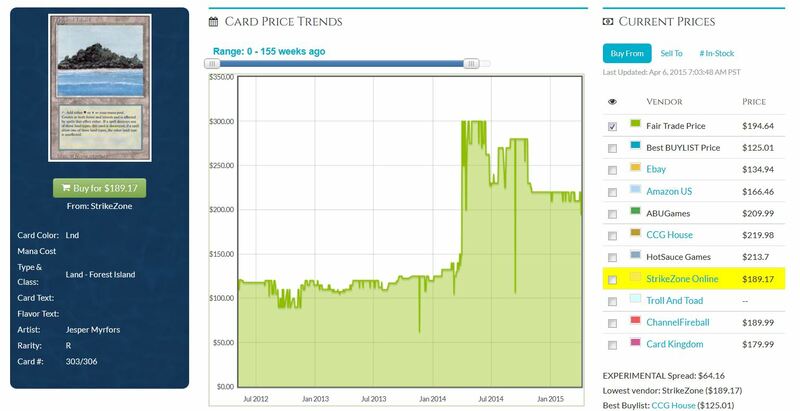 I think that the question for fetches is when to buy, and how long are we talking about holding them long term. I certainly can’t argue about the utility of Fetches. They are definitely going to see more play ongoing. What concerns me is that they were so recently printed. Each new block has been selling more and more than the previous, meaning print runs must be getting exhaustively long on new sets. What will happen when Zendikar fetches are reprinted in Battle for Zendikar, and the market is flooded even further with fetch lands? This is going to apply plenty of downward pressure on prices. Meanwhile even though Shock Lands aren’t played as much, they are slowly getting older and older. If they dodge reprint for another year or so, they could surely move higher behind strong Modern demand, right? Maybe the answer is that neither are amazing investments? Or perhaps only foils are wortwhile since they’re much rarer? I can certainly see arguments against going deep in either of them…they’ll always be liquid and in demand, I’m just not sure how huge the supply is going to grow. How do you feel about buying into supplemental product like Commander decks and Conspiracy? I know I got burned pretty bad when they decided to re-release the C13 boxes with multiple TNN decks, so that drawer of my room is pretty much wasted 😛 What’s your strategy for avoiding pitfall products or unexpected market flooding? You pose a very tough question, and one which merits lengthy discussion. Years ago, you could buy any supplemental product, throw it in a closet, and make money a few years later. Now with print runs so much higher, it’s not quite this easy. I’d be hesitant to advocate buying into anything supplemental such as the Commander decks and the like. WOTC is just making SO many of these since there are so many more players demanding them. The Intelligent Investor and Security Analysis are in my bookcase, so it is no surprise that I enjoyed your approach and article last week and this week. Knowing what you know and dont know seems essential. Last week I raised Damnation as a target – and note you were not sold. This week, Jarad Yost has agreed in his promo article that the chances of damnation reprint are practically zero for a few years and to grab it for casual demand. In hindsight, that does not make me right, as it is a guess – the area I know is modern. I do not claim to know EDH markets, or what outside factors claim damnation as a target. So this article is exactly on point – instead of splitting off onto many tangents and trying to be everything to everyone, sticking to the format you know seems essential. Each of these are dependent on picking them up for the right price. Lord of Atlantis is a difficult card to reprint from a flavour perspective, due solely to the name. Master of the Pearl Trident is a functional reprint. Lord of Atlantis is played in multiple formats and extremely difficult to reprint other than in a supplementary tribal product. The question remains though – has it been reprinted too much in the past to ensure supply will always outstrip demand? Master of the Pearl Trident, is probably not a terrible pickup seeing both modern and legacy play in a deck. Although, Kiora having the potential to return to Zendikar with merfolk (kiora’s follower anyone?) puts the possibility of a merfolk reprint in the picture. She was expressly there to find monsters to fight the eldrazi – finding other merfolk would probably work. Foil Monastery Siege – this is a stronger version of Kira, great glass spinner, in the same way that Outpost Siege is a stronger version of Chandra Pyromaster for Jund decks that are that way inclined. selected in the correct mode (dragons), it even protects itself. Add to that, it has seen recent play in legacy merfolk (which although I am not a legacy aficionado, when i see “sees legacy play” i look twice at the card). The foil multiplier of the card is too high at the moment, but surely if this drops a little or can be picked up on the cheap, it seems a fairly risk free proposition. Thank you so much for the thorough comment! 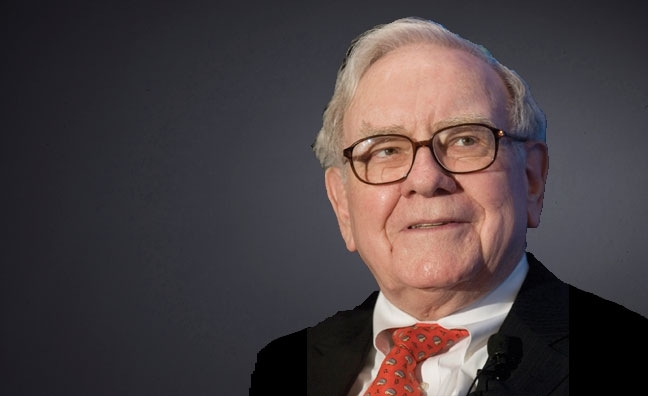 I’m thrilled to hear there’s another Buffett disciple in the community :). Have you read One Up On Wall Street by Lynch? That’s another one I enjoyed and learned a decent amount from. Though I’ll admit the strategy does seem…boring. But the more I research, the more I learn that boring can often make for the BEST investments. Flashy stuff like Bosium Strip buyouts and Ojutai hype can make people money, sure. But there are plenty of LOWER RISK ways to make bank over the long haul. Of the two ideas you mentioned, I think I’d like Lord of Atlantis more. How expensive are the foils of that card? Probably a fortune, but to your point – what kind of downside actually exists? WOTC had their chance to reprint it, and they chose not to. Surely that’s a compelling argument…I LOVE this idea. As for the other – I’m not going to claim I know enough to make a call there. I would encourage you to head into the Pro Trader forums and join in the discussion there if you haven’t already. For $5 you can create new threads sharing your ideas, and many of the writers here at MTG Price will share their thoughts. 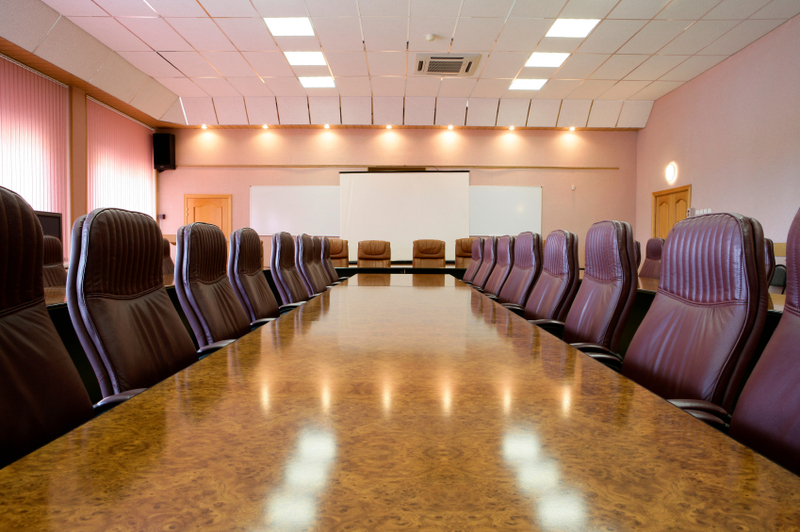 This way you get to tap into everyone’s expertise, and not just one person’s. Just my biased opinion :). Hope to see more insightful comments from you in the future. Thanks again!!! Great article!! Really enjoyed it and it’s making me think if I’m spreading myself too thin with my investments in the Magic stock market. My main targets are Foil Legacy Staples that I think are undercosted, Foil fetches, and unopened boxes and fat packs which has been my thing for several years. My least accurate and most volatile items of “investing” are on Standard cards and new releases. 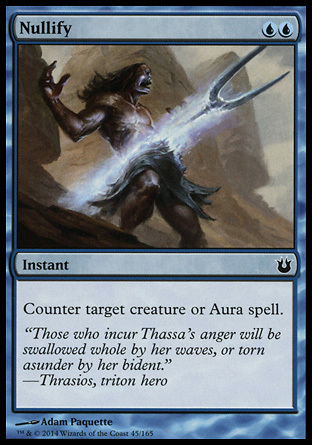 I “hit” on Thunderbreak Regent, foil Outpost Siege, Stoke the Flames, and Tasigur but a card like Thunderbreak is already due for a reprint and I just have a feeling Tasigur is getting one within the next year cause Wizards likes to reprint the heck out of good rares to sell bad product ie $18ish Coursers in $20 Clash packs. I play standard and like foils but you are right about one thing, I’m never checking the prices on the Dual lands from Revised I’ve started to acquire. I’m not worried if they fall $5-10 and I’ll never get the money back from them cause they are being reprinted or rotating or just not good in the format. I hit huge on buying Theros foils real low this past summer but I may have overvalued my Standard market sense…so thanks for making me think about what I’m doing with my Magic Investments. And I do have a question or 2, as more of a box collector as mentioned I’ve done real well (although I haven’t sold them yet) on boxes like Rise of the Eldrazi, New Phyrexia, and Innistrad (I got super lucky and got 4 @ $100 each from a comic store) and Modern Masters but my Dragon’s Maze boxes I’m not expecting too much from and Conspiracy might be a permanent loss (cost avg $100 after starting closer to $120 to be honest). So question 1, when do u decide is the right time to sell or how should I approach selling? And RTR box prices are making me re-evaluate things as well, because with Modern staple Shock Lands and Legacy Staple Decay and Deathrite I would have expected the boxes to be $150ish by now…so question 2 is has Wizards finally started printing so much product that sealed boxes will not have the same investment value that they used to? Khans might have enough juice to be worth investing in, but even Gatecrash isn’t going up and Theros block boxes don’t seem too valuable either so Khans boxes might be the exception…thoughts?? Thank you and keep up the excellent work! It sounds like I can learn a great deal from your areas of expertise! I wish I knew enough about Standard to pinpoint which opportunities have the most upside. Especially with foils, which can be real hit-or-miss in Standard. I hope to see more of your thoughts in the future! Glad this article is still useful to you, despite its purposeful avoidance of Standard :). Sealed booster boxes are SO tricky right now. You hit the nail on the head with your questions: my fear is that WOTC is printing SO MUCH of the new sets that the upside in booster boxes could take years to realize. 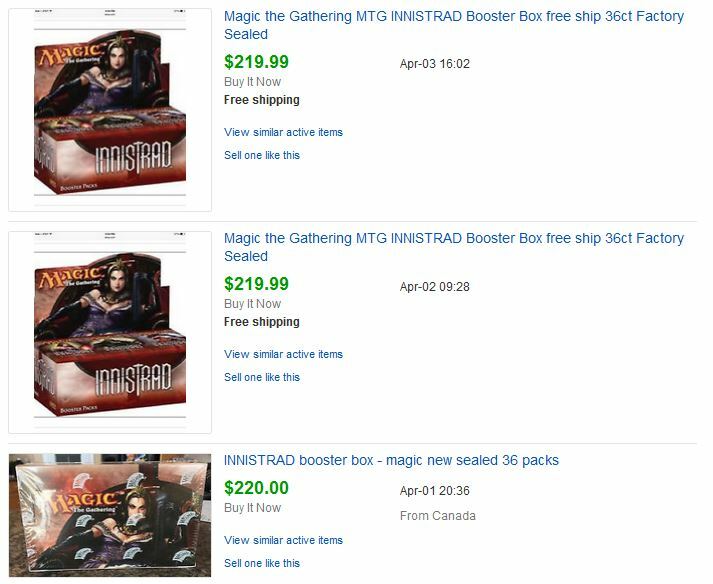 I just recently gave up on my Avacyn Restored Booster Boxes – it was so disappointing that after fees and shipping, I barely profited on these boxes after sitting on them for a couple years! That’s a horrendous ROI in the world of Magic. Heck, it’s horrible in the world of Wall Street, where the market has had 3 years straight of double digit gains. I am sitting on a bunch of Return to Ravnica Boxes, only to watch them inch up like a penny a day. It’s brutally slow. I suppose it’s still one of the safest investments you can make, as boxes from good sets with Eternal staples really don’t drop much in price. But if the supply is just so large right now, it may mean dead money for years. If you’re ok with that, then I still think you will profit eventually. But I have to imagine there are better opportunities elsewhere. Perhaps it’s time I write a thorough article covering my experiences with Booster Boxes. There’s a lot of overlap with what you said and my own experiences, and my convictions are growing by the day. Spot on about shocks and duals. I’m also heavily invested here. It is worth noting that even if the meta didn’t shift that lower priced duals are a rock solid hedge. 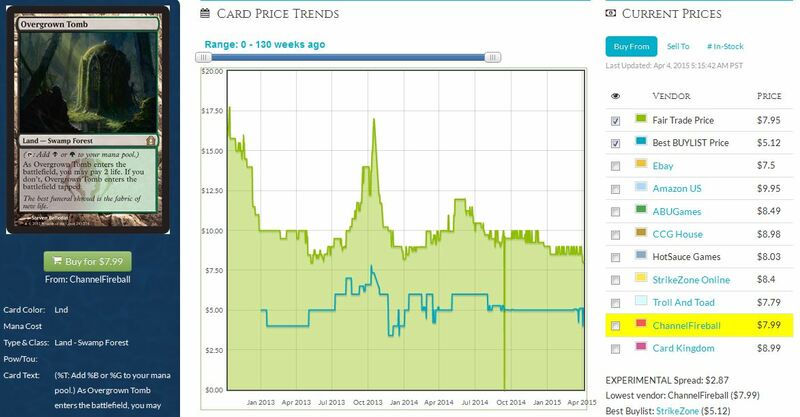 As more players enter into Legacy the strain on USeas & Volcs will drive the price even higher. We’ll begin more players look to decks like Elves, Maverick, Dredge, Infect, Belcher and anything else not using upper end blue duals. Getting in on presentable Bayous in LP condition or better is a lock. Same logic applies to cards like LED. To a lesser extent I like decks using zero duals but reliant on tough to find staples. MUD reserved list artifacts notably. These will be slower but again, it’s as safe a hedge as it gets. Glad to hear I’m not the only one behind Duals. I don’t hear that much chatter about them these days, but I think that’s even more reason to buy into them. I’m picking up the boring cards while everyone gets excited about hyped up cards. 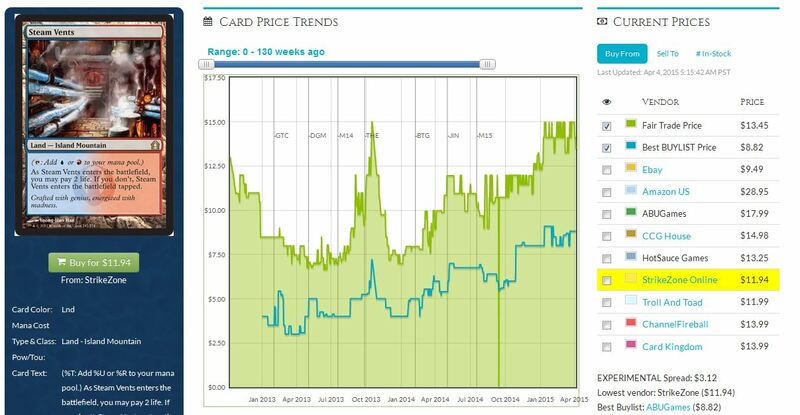 Then when the tides shift and SCG bumps their Dual prices again, the tables will turn and we’ll be in a good position. Great article, very enlightening as a rookie investor and MTG player. Something I can’t quite reconcile is the concept of cards being undervalued. By my understanding there is no real intrinsic value to compare cards to the way you can stocks, so how do you determine if a card is under/over-valued? 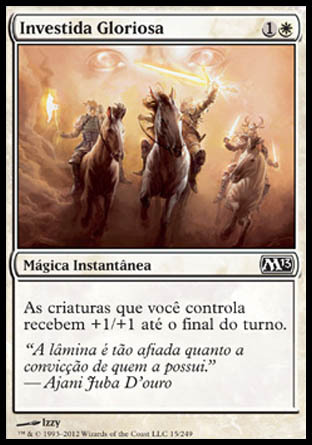 Is that simply based on the assumption that cards will rise in the long run as more and more players pick up Magic? I suppose you can dividends to being able to play with the cards hah. Thanks for the good read! You’ve made a very good point. In a commodities market, there really is no under/over valued. In a vacuum, the Invisible Hand finds the right price for any card. I think you find opportunities for investments not based on a card’s balance sheet or cash flow, but on its utility and likelihood for increasing demand / decreasing supply. It’s a bit more about speculation here, I’ll give you that much. 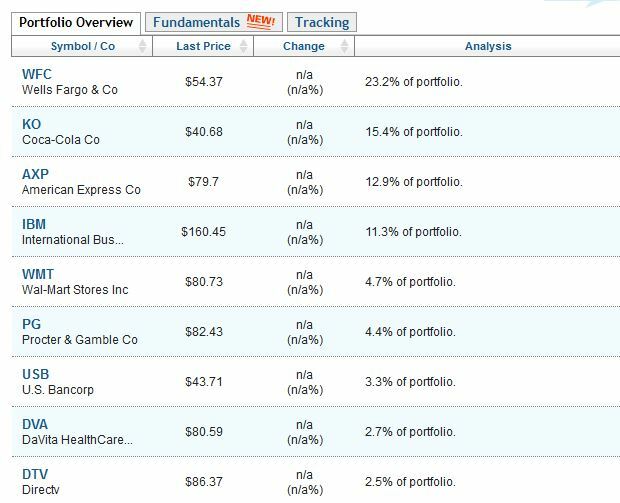 All the more reason why I keep my MTG investing to a fixed amount while continuing to invest heavily in stocks. I like your analogy of dividends = having fun playing with cards (and potentially winning tournaments!). Nice one! That’s a good point about commodities, which seems to suit MTG. 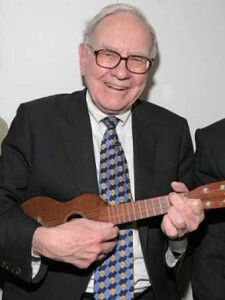 Perhaps in a sense it’s more like investing in small caps rather than bluechips! Thanks, looking forward to your future articles! Or even investing in oil! Uh oh, that’s a much scarier thought…scratch that ;-). hand out business cards along with your business is sure to grow. be completely built-in with Microsoft Office environment 2010. I guess out of principle I have to respond to this, though I have a feeling it’s not legitimate. If it is, please accept my apologies but I don’t understand the purpose of the post. Agree this isn’t the best forum for a long chat. Have you tried the mtgprice forums? They’re part of the Pro Insider deal, so it does cost a few bucks. But it gets you in touch with a bunch of the writers on this site in a medium that may be more facilitative for engaging debate.